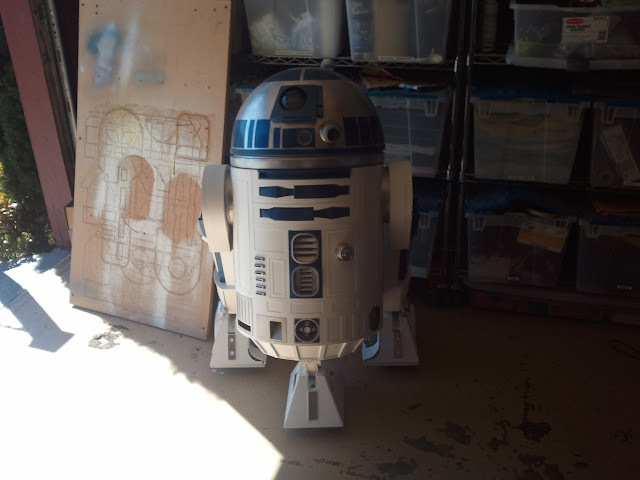 You Can Build R2D2 or BB8 easy! The video is a little bad, working r2 and using the remote are a little difficult…. but here is a pic shortly after the vid. Almost done, still needs a lot of foot work…. So I have programmed the electronics for R2d2… I ordered an Arduino UNO, and also an rMp3 player from Rogue Robotics. Its an extremely easy hookup.. Connect the yellow wire from the rc receiver to pin 8, and connect 5v and ground to the black and red wires of the arduino.. turn on your rc unit and upload the following code (I had to add external power to my arduino because of the extra draw of the rc receiver. But here is the current code…. You may have to play with the values from your rc control based on your own unit, but this code works perfectly with my unit… push stick up for sound randomly, and down for a random music file… Next up, I will be integrating a VRBot Voice recognizer chip for some fun voice effects…… kind of like the interactive r2… code and demo to follow. For now, here is r2’s voice youtube demo. SFPD not looking out for citizens. Its been a while, but Im sidetracked into 3d printing! EvoLve theme by Theme4Press • Powered by WordPress You Can Build R2D2 or BB8 easy!